VaporSolve® 100 is a specially formulated 100% solids epoxy coating designed for use over concrete with high moisture levels for the purpose of isolating the concrete from moisture sensitive flooring. When used without a primer in a single coat application, it is referred to as the VaporSolve® Basic System. This system should only be used over concrete that has never been treated with reactive silicate curing compounds or densifiers. VaporSolve 100 has been formulated with low viscosity and excellent substrate wetting capabilities to promote penetration and adhesion. The special hydrophobic curing agent allows for adhesion to damp or wet concrete. This product will cure fully even when applied underwater. In addition, VaporSolve 100 is based on Bisphenol F epoxy which gives the material enhanced chemical crosslinking over products based on standard Bisphenol A epoxy. More crosslinking helps to reduce the coating’s moisture permeability and increases its long term resistance to water and alkalinity. The material contains no plasticizers, phenols or unreacted amines that could migrate out of the cured coating and trigger osmotic blistering. 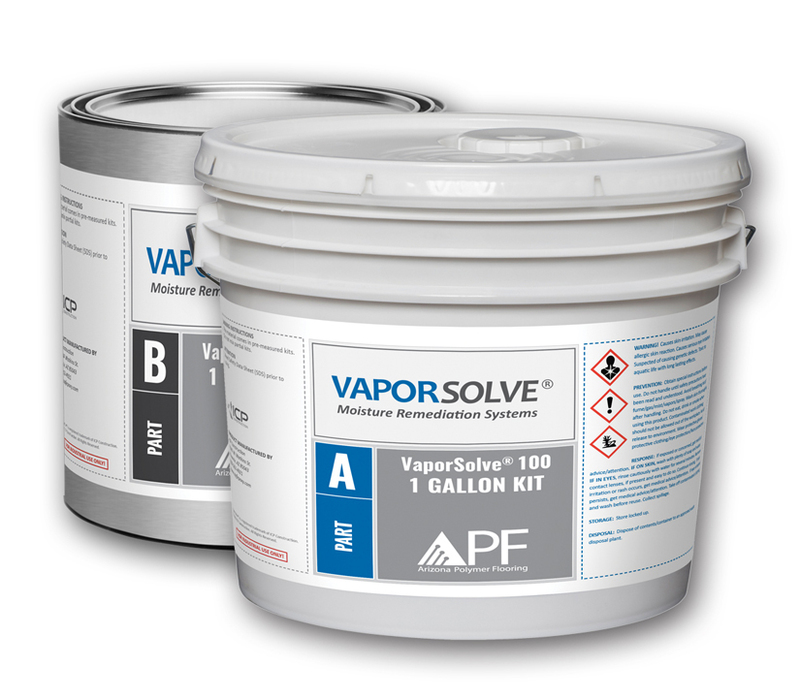 VaporSolve 100 is available in a fast cure version when quicker turnaround is necessary. The product may be applied at temperatures between 40-100°F. 100% solids epoxies are more prone to adhesion failure than properly formulated water-based epoxies when applied to silicate contaminated concrete. If silicate materials have been previously applied to the concrete, or if the history of the concrete cannot be positively determined, use VaporSolve® Primer underneath VaporSolve 100. The VaporSolve materials are designed to remediate all concrete moisture problems, regardless of severity. These systems may be used in new construction settings when a schedule must be met, yet the concrete is not dry enough to install moisture sensitive flooring. They can also be used over concrete with known moisture problems and over concrete that has been placed without a vapor retarder as a means of preventing future moisture problems.